Muskrat or musquash are originally from North America and Mexico; today also spread throughout Europe, Asia, and South America. 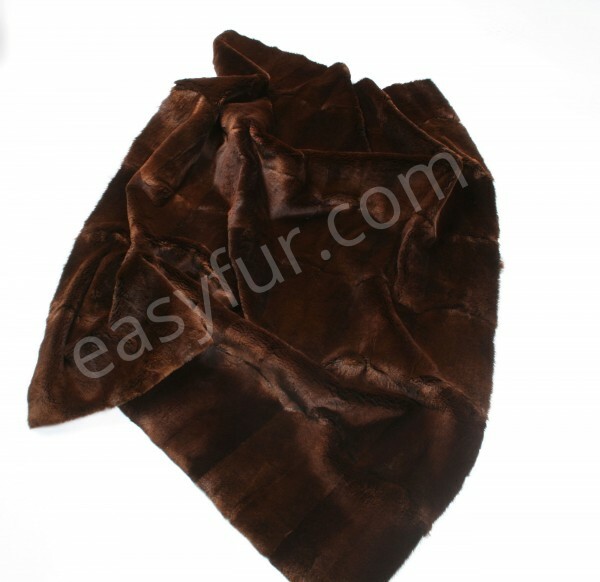 Furriers use the musquash skins with a natural finish but also shorn, or partly shorn. Musquashs have a silky and soft, dense hair, especially on the belly. The belly often gets plucked or shorn which creates a velvet look of the fur. Muskrats have become a serious danger to the environment because they submerge dams and dikes. You distinct muskrats between "northern" and "southern" muskrat, with slightly smaller skins coming from the south. Particularly high quality of the "Black muskrat" from some states of the USA with fine dark, almost black hair. The parts of the fur are differentiated between "back" and "dew" (belly). The natural color of the musquash is medium to dark and blackish brown, getting brighter from the back to the sides. The stomach is gray-beige, and the underwool is even lighter. Related links to "Musquash Fur Plate - sheared"
Customer evaluation for "Musquash Fur Plate - sheared"